When I first started collecting basketball cards, it started off as just a fun way to collect the players that I loved to watch on television. I had no idea that it would turn into something that I spent hours on, doing research on different products and learning about what to collect by visiting local card shops. In the beginning, I was in awe of a simple jersey card or any autographed card. It was a little time before I was really able to distinguish between cards that were not just rare, but highly collectible and valuable. A couple years into it I was able to determine which cards I am most passionate about and then slowly began to hunt them down adding them to my collection. These are some of those cards. These first photos show some of the great inscription cards that Upper Deck has produced throughout the years. For me it is always unique to see a player add something along with their signatures. Inscriptions cards are something that I have always loved to collect and will continue to do so. The Kobe Bryant card where he inscribed “Black Mamba” is my favorite of the group. It was a card I actually pulled out of a box and it was a moment I will never forget. A Michael Jordan signed inscription card is something that is on the top of my wish list and I will continue to dive into Upper Deck basketball products searching for one since they have the exclusive agreement with MJ! In addition to inscription cards, multi-signed cards are something that caught my eye right when I first got into the hobby. Having a historic combination of Jordan, Magic, and Kobe on a card, or a draft class pairing such future stars as LeBron James and Carmelo Anthony are some of my favorite cards. 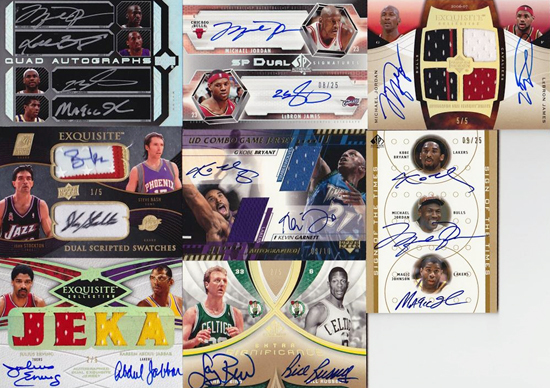 In my opinion, the 2007-08 NBA UD Black quad autographed set was perfectly made set with bold silver on-card signatures. The Jordan, Kobe, LeBron, and Magic card is limited to only 10 copies making it a tough find in high demand. Obviously, the hardest cards to come by are ones limited to just one copy. I have been fortunate enough to come by a few, but I am hoping to add more to my collection in the future. The Steve Nash 1-of-1 card pictured below is one that will never leave my collection as it features a NBA logo patch along with an autograph of the 2-time league MVP. 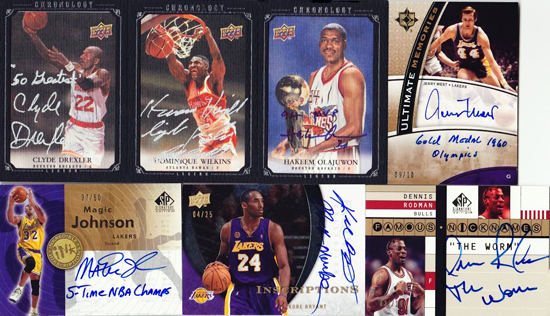 These last two pictures capture my favorite basketball set Upper Deck has produces; the Exquisite Collection. It took me awhile to get into Exquisite because of the high-price of the packs, but once I realized how much value Upper Deck loaded into each tin, I was hooked. There really is no product that is of better quality for basketball than Exquisite Collection. From the on-card signatures to amazing patches and other innovative inserts, it is truly an amazing set to collect. One of the reasons Exquisite Collection products are so popular is because they have some of the nicest looking rookie cards. This photo shows some of my truly “exquisite” rookie cards from the different draft classes with high-profile rookie cards from players like Dwight Howard, Kevin Durant, Chris Paul, Stephen Curry, Kevin Love, and Derrick Rose. One day, I am definitely hoping to add a LeBron James rookie card from this set! Lastly, my favorite insert series in the Exquisite Collection are the Limited Logos cards! What better card is there to get then an autographed numbered card with a huge patch on it? The Limited Logos set has some of the biggest patches on cards that you will find in any basketball product. In addition to that, the checklist for the Limited Logos set is always strong with Hall-of-Fame level players like Bill Russell, Michael Jordan, Magic Johnson, Larry Bird, Julius Erving, and John Stockton included. You can also find future Hall-of-Famers like Kobe Bryant, Ray Allen, and Kevin Garnett! The most exciting thing about the Upper Deck Basketball products like Exquisite Collection is the continual efforts the company makes to create innovative new inserts and sets that reinvent the category and get collectors buzzing. I’m personally pretty excited to see where they take this product in the future with booklet cards that contain twelve signatures of Michael Jordan and super tins that include a variety of autographs from one superstar player like LeBron James. 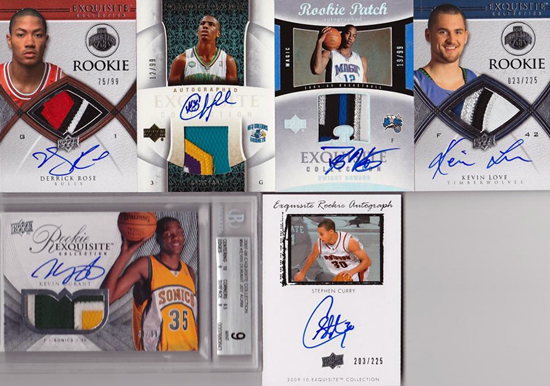 And while there have certainly been changes in the basketball market, the good thing is we have the choice to collect limited-edition products from Upper Deck over the years that have the value we cannot find in any other releases. Mitchell Panajian is a passionate basketball collector living in Southern California who is currently attending college at Loyola Marymount University pursuing a major in business administration. His future plans involve working with a team like the Los Angeles Lakers or Los Angeles Clippers. He enjoys attending professional sporting events as well as interacting with players. Great write-up! Much like yourself, i’ve been busy collecting many UD cards with inscriptions over the years, probably one of the best features that UD sig cards have in my opinion, plus the great design! Many of those cards look very familiar to us Mitch – but still awe inspiring!